This is my second Live Vibe House Concert to perform at. The last one was with G. Love and Graham Wilkinson. This one features WILL HOGE and WAYLON PAYNE. Will is a 2013 Grammy nom and Waylon played Jerry Lee Lewis in Walk the Line. I will be performing my AUSTIN CENTRIC set. 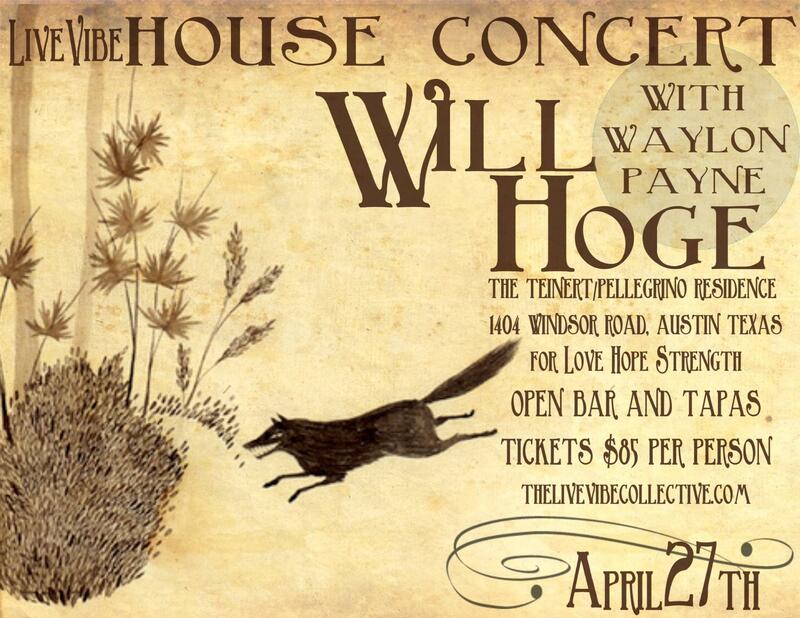 We will grace the stage with a very small audience, open bar and private chef at a beautiful home in downtown Austin. And it is also a benefit for LOVE HOPE STRENGTH, a truly amazing organization. Click the link below for more info and to purchase tickets! This entry was posted in Shows and tagged Austin, austin centric, collective, DJ, House Concert, Live, live vibe, Love Hope Strength, Mixer, Mixer Rogers, Music, Rogers, Vibe, Waylon Payne, Will Hoge. Bookmark the permalink.